Received 21 November 2009; revised 7 January 2010; accepted 9 January 2010.
used in cardiovascular therapeutics . and produces a regional vasodilatatory effect . Health (NIH Publication No. 85-23, revised 1996). 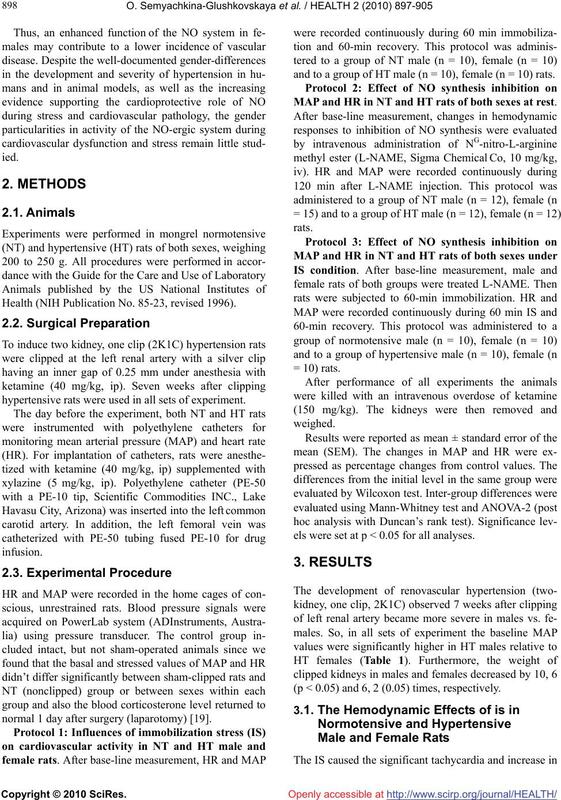 hypertensive rats were used in all sets of experiment. normal 1 day after surgery (laparotomy) . and to a group of HT male (n = 10), female (n = 10) rats. MAP and HR in NT and HT rats of both sexes at rest. els were set at p < 0.05 for all analyses. (p < 0.05) and 6, 2 (0.05) times, respectively. 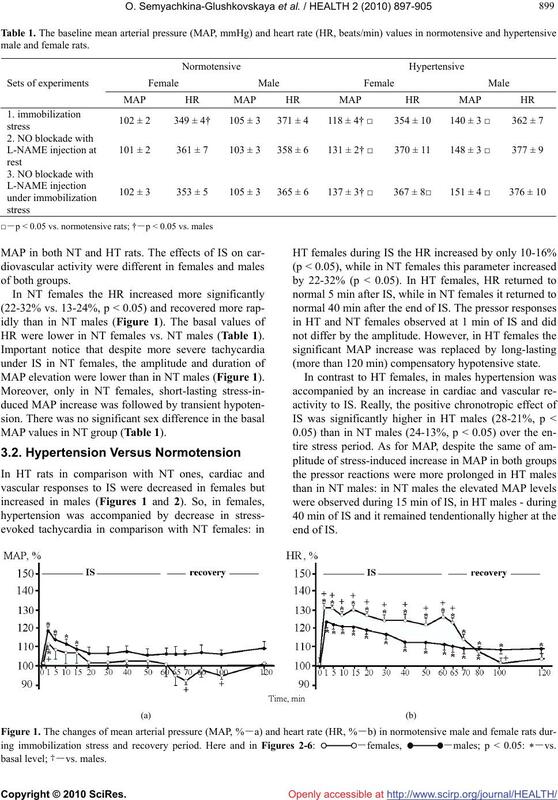 HR were lower in NT females vs. NT males (Table 1). MAP elevation were lower than in NT males (Figure 1). MAP values in NT group (Table 1). (more than 120 min) compensatory hypotensive state. ing immobilization stress and recovery period. Here and in Figures 2-6: －females, －males; p < 0.05: －vs. changes depended upon the gender and the state of rat. much more continued when compared with IS alone. ing immobilization stress and recovery period. normotensive male and female rats at rest. 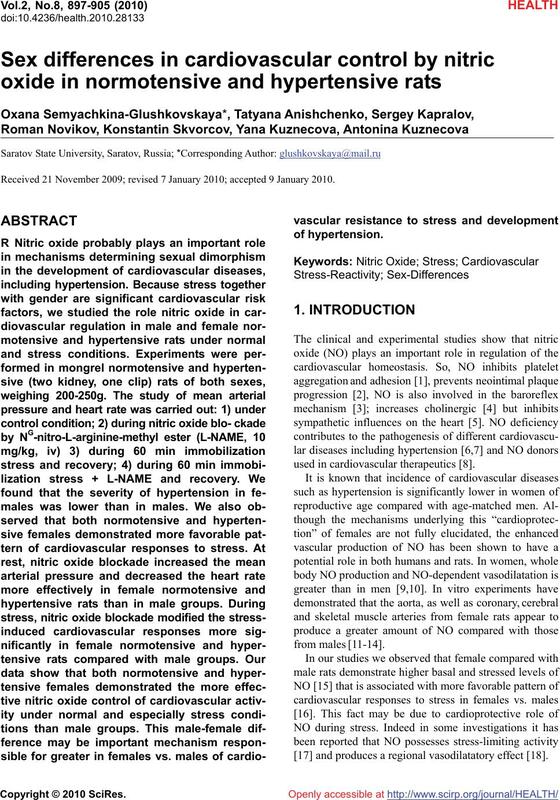 normotensive male and female rats under stress condition. between sexes in NT group (Table 1). minutes of experiment in female and male HT animals. and slightly changed in HT males (Figures 2 and 6). sponses pattern in male and female HT rats. females and HT males in this experiment (Table 1). and state (rest vs. stress). renal blood flow was lower in females than in males. hypertensive male and female rats at rest. hypertensive male and female rats under stress condition. 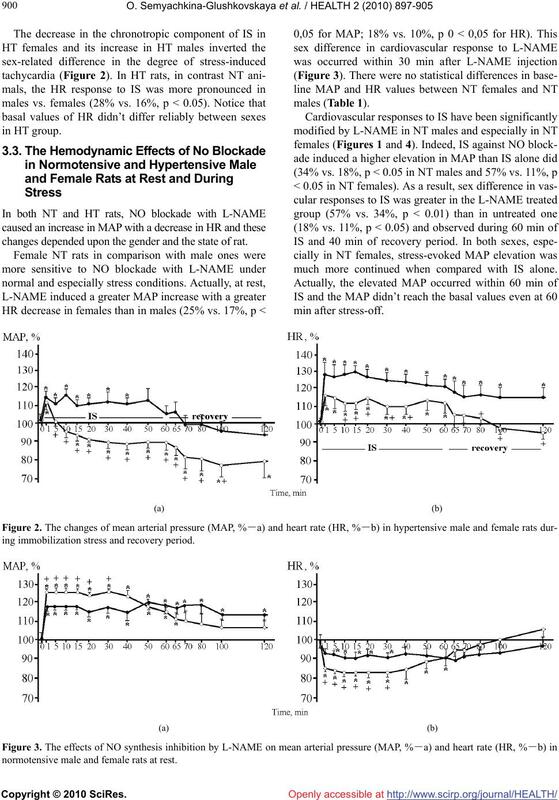 pressor effects were weakened compared with males. parameters at rest and during stress. depended upon the gender and the state of rats. blood NO concentration in both NT and HT females vs.
male groups under normal and stress conditions . compared with NT and HT males. responses to NO blockade  between NT and HT rats. sure was associated with greater eNOS activity in aorta. served in many studies is due to increased scavenging. tained in the whole vascular beds or in local circulation. experimental animal models and in humans. Conflict of Interest. Conflict of Interest: none declared. Heart and Circulatory Physiology, 285(2), H637-642. cific. News Physiological Sciences, 17(6), 202-206.
ology and Medicine, 226(9), 814-824.
system. Uspechi Fiziologicheskikh Nauk, 32(3), 49-65.
vessels. Pharmacological Reviews, 55(2), 271-324.
women and men. Hypertension, 32(4), 730-734.
and Circulatory Physiology, 267(5), H2311-2317. 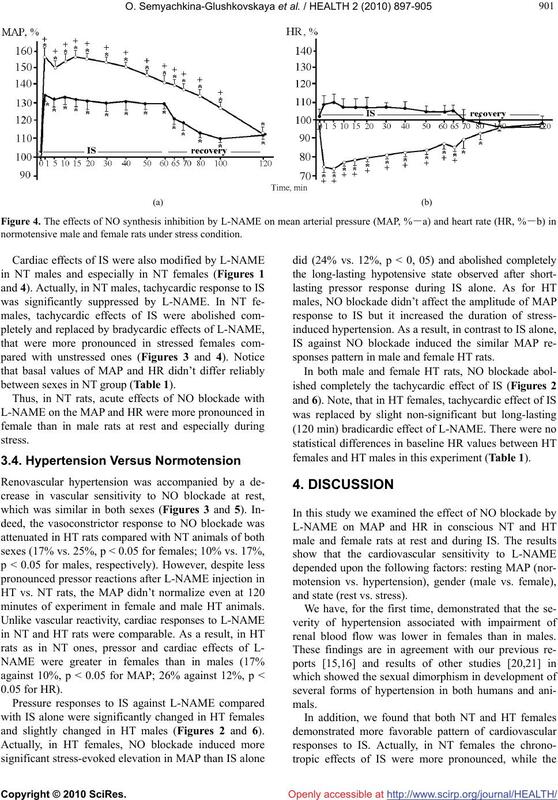 arteries by enhanced basal release of nitric oxide. 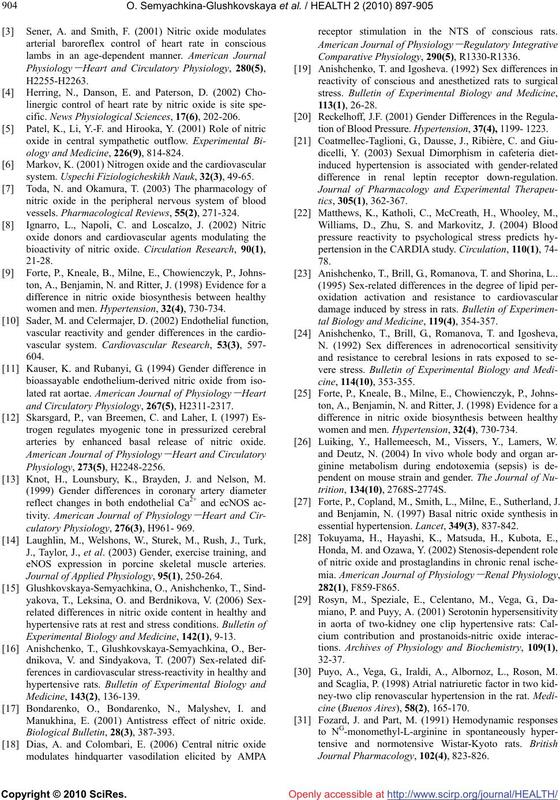 Knot, H., Lounsbury, K., Brayden, J. and Nelson, M.
culatory Physiology, 276(3), H961- 969.
eNOS expression in porcine skeletal muscle arteries. 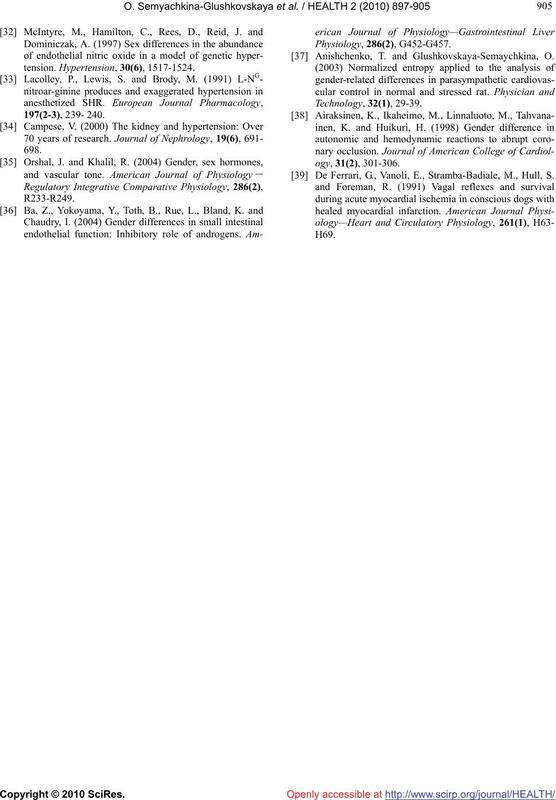 Journal of Applied Physiology, 95(1), 250-264. Experimental Biology and Medicine, 142(1), 9-13. 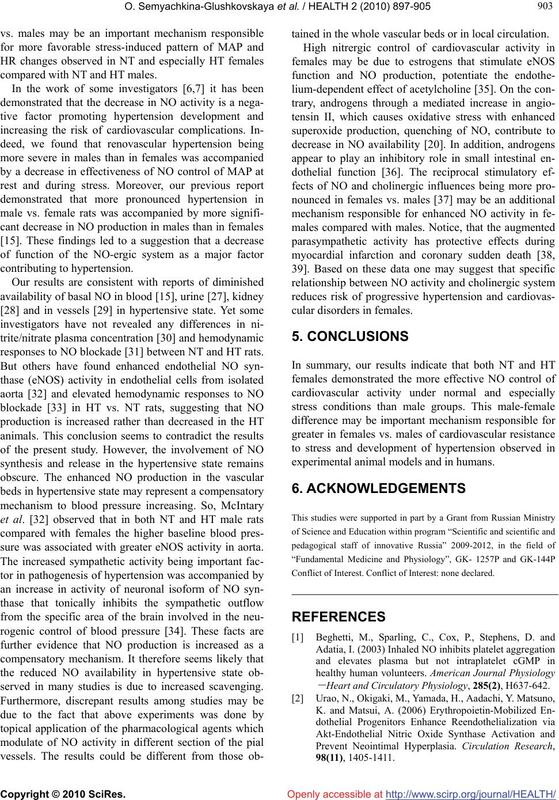 Manukhina, E. (2001) Antistress effect of nitric oxide. receptor stimulation in the NTS of conscious rats. tion of Blood Pressure. 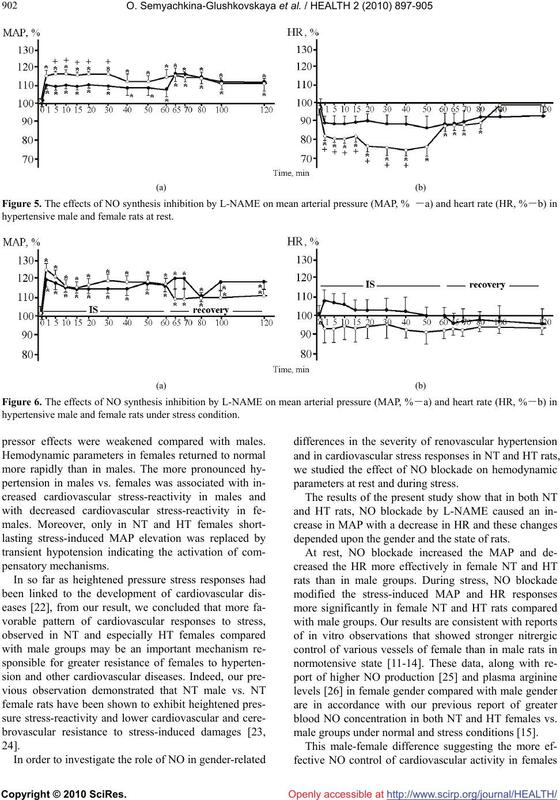 Hypertension, 37(4), 1199- 1223.
difference in renal leptin receptor down-regulation. Anishchenko, T., Brill, G., Romanova, T. and Shorina, L..
tal Biology and Medicine, 119(4), 354-357. Luiking, Y., Hallemeesch, M., Vissers, Y., Lamers, W.
 Forte, P., Copland, M., Smith, L., Milne, E., Sutherland, J.
essential hypertension. Lancet, 349(3), 837-842. Puyo, A., Vega, G., Iraldi, A., Albornoz, L., Roson, M.
cine (Buenos Aires), 58(2), 165-170. Anishchenko, T. and Glushkovskaya-Semaychkina, O. De Ferrari, G., Vanoli, E., Stramba-Badiale, M., Hull, S.